Middle Atlantic Products today announced that the company was recognized with two Stellar Service Awards by the readership of Systems Contractor News (SCN). The Middle Atlantic website (Middleatlantic.com) garnered the Gold Best Website Dealer Portal Award and the Platinum Best Design Services Award, demonstrating the company's commitment to providing digital capabilities, tools, and resources to deliver relevant and comprehensive support customers need to design AV experiences for their clients. Built with single sign-on (SSO) technology, this integrated digital experience provides users enhanced access within the website, including displaying product pricing and availability, plus the ability to place and track orders online. According to Middle Atlantic, the goal is to provide access and tailored content based on each user's needs, and putting the right resources at the customer's fingertips. For example, for purchasers, the SSO profile indicates their role and provides commerce buttons and pricing; for those in accounting, users are given access to invoices and credit information and can initiate an RMA; and system designers are able to access design tools, specification assets, compatible products, and industry training. Because the design tool is integrated within the site, designers gain the added advantage of being able to collaborate on designs within their companies and are assured of product compatibility across categories. "Our website is a vital tool for supporting our customers," said Ryan Tilley, marketing manager, Middle Atlantic Products. "With that in mind, we're continually striving to enhance the experience by making the site more efficient and intuitive to use, while also ensuring the design tools are the easiest to use with the most value-add in the industry." 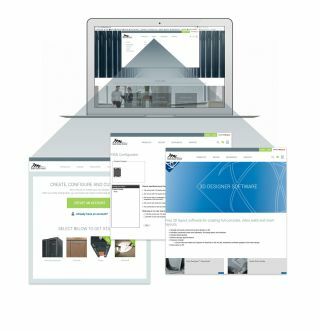 "When users sign on [to our website], we can tailor the site to their needs and connect all the relevant products and services that are critical to achieving exceptional AV experiences," he continued. "We're very grateful to the readers of SCN for this recognition, as these awards reflect our ongoing commitment to customer-service excellence." Other features of the site include custom rackshelf search, design tools, and technical documents. The interactive feature guides for products and vertical market solutions allow customers to explore how products come together to complete an application. Finally, visitors can share and engage with the site through Middle Atlantic's social media channels, giving them another way to connect with the company and get the support they need as part of the design process.